The look and feel of OS X had its origins in the Classic Mac OS, long before we had iPhones and iPads. Today, millions of customers are looking at their iPhones and iPads and wondering why OS X looks the way it does. Those of us who grew up with the Mac tend to think of its OS as cast in stone as the way a modern GUI on top of a classic BSD UNIX system should look and feel. It's easy to fall into the idea that change is bad. The fact is, however, is that Apple has sold roughly 700 million iOS devices. That swamps the number of the Macs sold to date. And so, when it comes to thinking about the future look and feel of OS X, it's not a question of sticking with the origins, or, conversely, changing just in order to be trendy. Vast differences remain in the look and feel of these two OSes. Why must that be? Neither is the issue of legibility or clarity at stake. 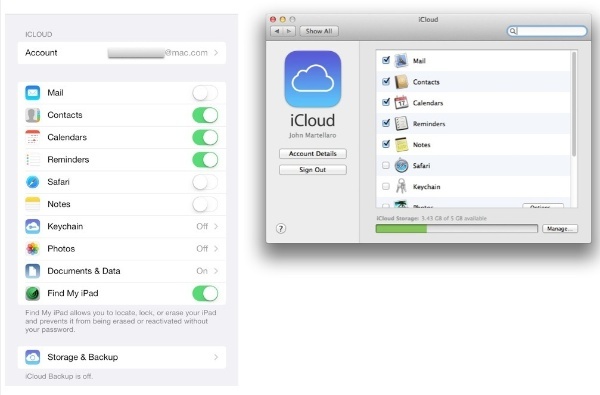 It's not as if one day Apple engineers woke up and said to themselves, "After 13 years, this UI is too hard to read!" Years of refinement in every little detail have made OS X very easy to use and pleasant to look at. Instead, I tend to think about how Apple wants its products to work together as a family of products. In order to do that, it's necessary to think about the long-term strategy. Part of that is a recognition that many customers new to OS X wonder why it looks the way it does. Right now, we know that Apple believes that Macs and iOS devices are generally used for different tasks. The Mac is a powerful content creation tool while the iOS family is used for more casual content consumption — with some emerging elements of creation with Microsoft Office and other sophisticated apps. However, just because the way we use Macs and iOS devices is generally different doesn't mean that they shouldn't have common functionality and appearance in things like settings, mail, browsing, messages, notifications, and so on. I think that in those areas where there is common functionality, it is wise for Apple to continue to introduce, as they have been, a more common look at feel. It just makes business sense to promote a reverse halo effect. That is, our affection for mobility and our iPhones and iPads tends to get reflected in our desktop and laptop Macs purchase decisions. I don't think this kind of design uniformity and elegance means that Apple is interested in toaster-fridges and 2-in-1 devices. Rather, continued refinements in the look and feel of OS X would simply be a recognition of modern user interfaces. Changes reflect the best understanding of modern look and feel, especially as displays become Retina across the product line. Finally, there may be a sense that there's no need for the Mac to look anachronistic simply to satisfy the graybeards. If OS X 10.10 makes these kinds of changes, it won't bother me at all. It's just part of moving forward with Apple products.